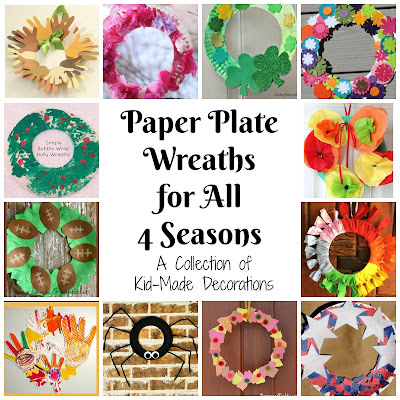 In the last few years we've discovered how easy it is to make a "Paper Plate Wreath" using a paper plate and some decorations. In fact, we find them so easy we've made them for several different seasons and holidays! Which is what inspired collecting all of these awesome posts from other bloggers too - because if they're that easy to make, why not make one for every season of the year? To Be A Kid Again shares a great idea for creating a Recycled Wrapping Paper Winter Wreath using left over wrapping paper. 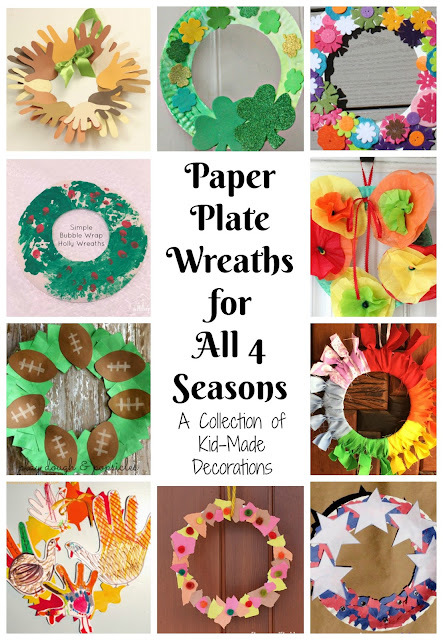 Washi tape helps make this paper plate wreath colorful just in time for the winter holidays in this Super Easy Washi Tape Wreath from 3 Dinosaurs. Use yarn and pom pom decorations to create a Yarn Paper Plate Christmas Wreath for the holidays just like they did over at 3 Dinosaurs. Keep it simple with paint and handprints like The Pinterested Parent did in order to create this Paper Plate Handprint Christmas Wreath. Use green tissue paper crinkled into small balls to create this Christmas Wreath from Easy Crafts for Kids. Simple Play Ideas shares several ideas for creating Easy Paper Plate Wreaths to be used during the holidays. The Pinterested Parent shows tips for how to make a Yarn Wrapped Paper Plate Christmas Wreath. Have little ones practice scissor skills while creating this Christmas Wreath Craft from School Time Snippets. Sparklingbuds shares ideas for how to create a spring wreath using milk jug flowers and a paper plate. Sparklingbuds uses this same cool milk jug strategy to create a Earth Day wreath that honors the Earth while using recycled materials. Use tissue paper squares and a colorful flower to create this pretty Spring Wreath from East Coast Mommy. Happy Hooligans used coffee filters to create this pretty Coffee Filter Easter Plate. Heading to the Ocean for a summer vacation? These Ocean Themed Wreaths from 3 Dinosaurs are simple enough they could even be made on a trip! Into watching several of the different summer sporting events? Create a Paper Plate Laurel wreath like The Gingerbread House did, and you can even wear it as a crown. Fall is all about apple picking, so why not create this Apple Tree Wreath from Play Dough and Popsicles? Little hands can help put together this DIY Colorful Fall Wreath from Mommy's Bundle which uses natural materials. I Heart Crafty Things shares how to turn the whole wreath into a turkey in this Paper Plate Thanksgiving Turkey Wreath. I just love some of the amazing ideas that these fantastic posts shared. I can't wait to try some of them out with the boys as the year continues. Our hope is to keep updating the post as we find more great paper plate wreath ideas, so don't forget to check back in!